District Magistrate is the Nodal Authority Of MDM scheme in a district. He/she heads the 12 member District Task Force,a body to supervise the scheme in district. District Basic Education Officer is the member-secretary of the District Task Force. 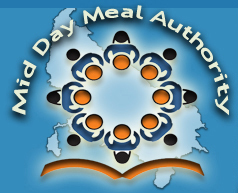 To assist the District Basic Education Office, a Mid day meal cell has been created in every district which has one District Co-ordinator and one Computer operator. To monitor the scheme closely and effectively, 8 member Block Level Task Forces have been constituted under Sub-divisional Magistrates.